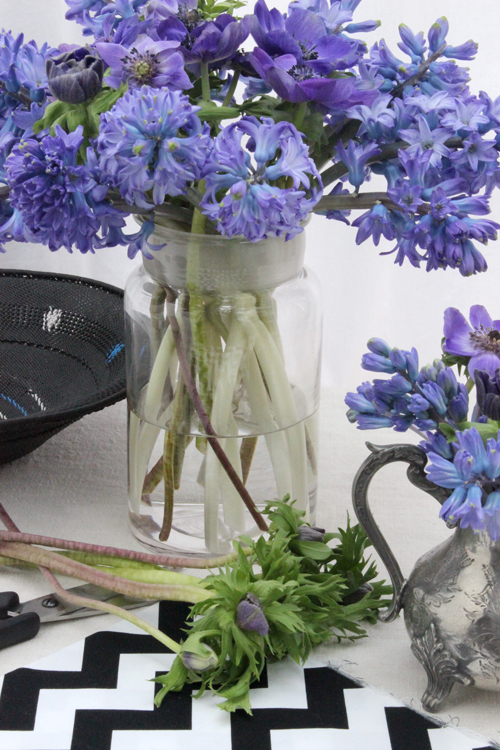 This week on Creative with Flowers - I'm featuring a mixed bunch of Hyacinths and Anemones. An interesting and colourful combination of flowers. 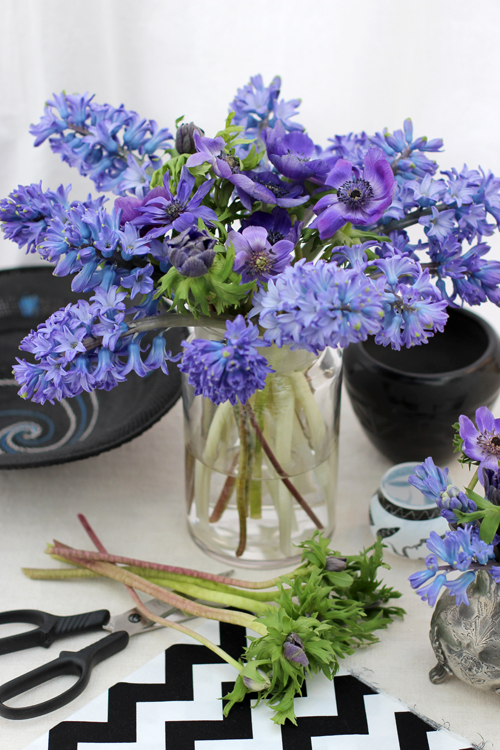 This series of blog posts - called 'Creative with Flowers' - are about using flowers in creative ways. It could be about how the flowers are combined - maybe in a little bit of an unusual way. 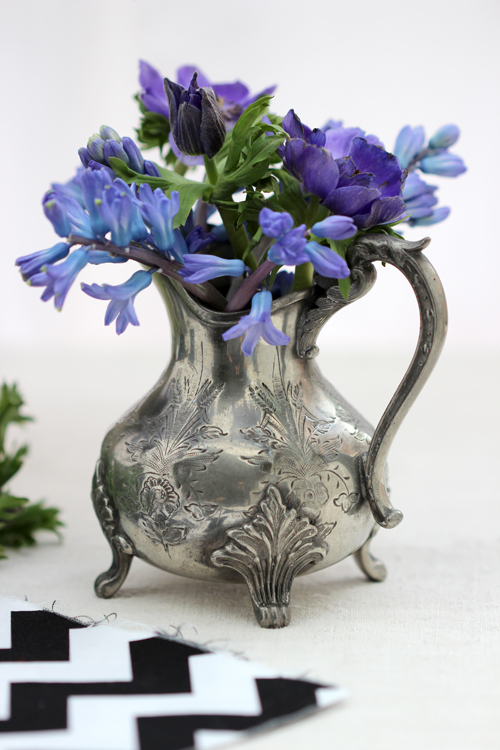 It might be the choice of vase - maybe not a vase at all but a container that could be anything from jugs, bottles, jars, tins or teapots - vintage or new it doesn't matter. As always my arrangements will be quick and easy - and there will always be lots and lots of colour! Sometimes on some hyacinths you can find little short offshoots - mini flowers growing in among the leaves. I always try to use as much of the flowers as possible - so in this case I made a side arrangement using the small flowers. I put them in a silver plated jug. One of my finds from one of the many London antique markets. By now most of the silver is worn off - but I kind of like it that way - full of patina. I removed all the leaves on the Hyacinths and used a clear glass container as a vase. The Anemones has a ruff of leaves around the stems just below the flower. If it's in good condition it adds a lot of texture and some greenery. 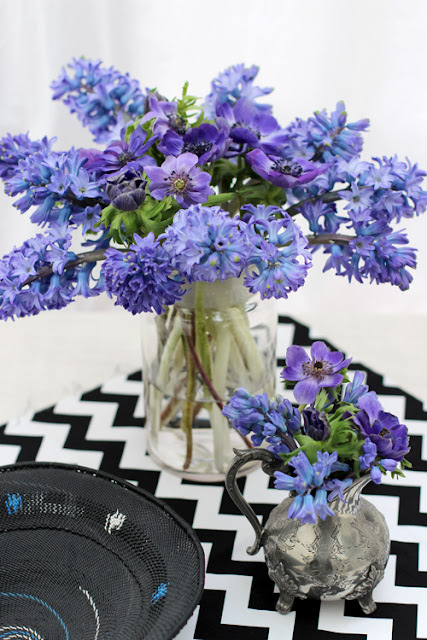 The Hyacinths has a lovely scent and lasts for approx 7- 10 days - so very much good value for money. The Anemones on the other hand do not last for that long, maybe 5-7 days. 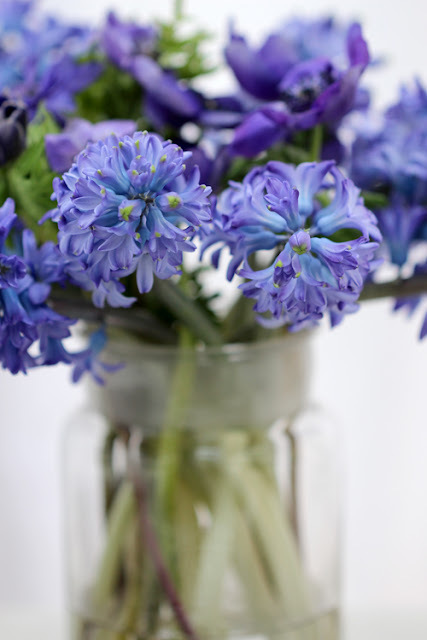 They are also much more delicate - both petals and stems are very easy to damage while handling the flowers. The two flowers complement each other in both colour and texture and gives a lot of visual variation. I have also added some darker props that picks up the black in the centre of the Anemones. 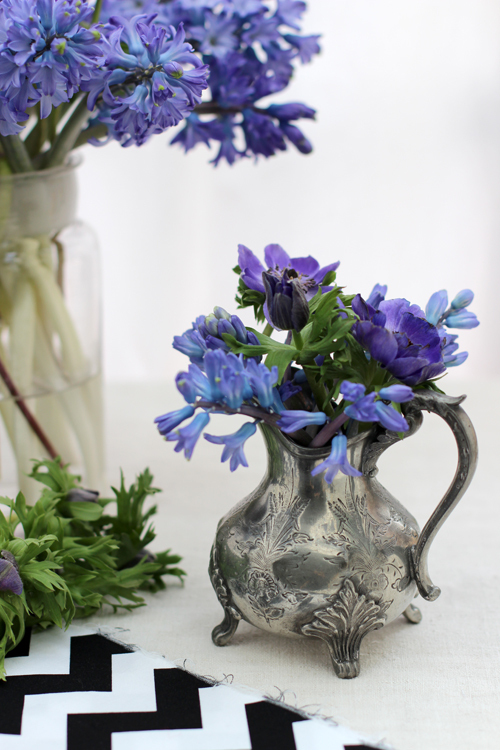 Enjoy your flower arranging and have a fabulous and floral Wednesday! Thank you for visiting 'Of Spring and Summer'. I will be back on Friday with another 'A Bunch for the Weekend'. I'll see you then.